Penn State World Campus student Gregory Hines-Garrison plays Big Bird in Sesame Street Live's "Make a New Friend" show. UNIVERSITY PARK — When he’s not tucked into a quiet corner of a hotel studying for his college degree, Gregory Hines-Garrison can likely be found on stage, inside the towering costume of a toddler’s favorite feathered friend: Big Bird. 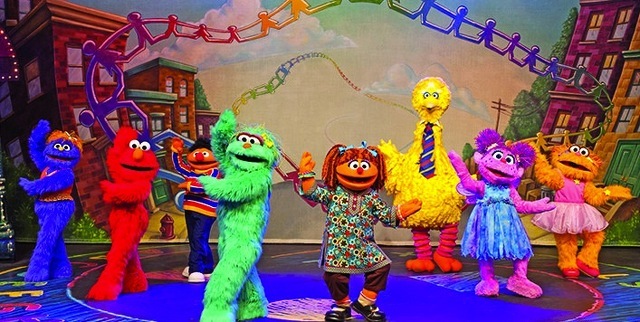 Hines-Garrison has been on the road with Sesame Street Live since August 2012. A few months after joining the national tour, he began studying for an advertising and public relations degree through Penn State World Campus. The 23-year-old Philadelphia native currently plays both Big Bird and the fuchsia monster Telly in Sesame Street Live’s “Make a New Friend” show. He completes his coursework between performances — sometimes as many as three a day. The tour often visits two or three different cities in the same week. Hines-Garrison graduated from Penn State on May 8. After his Sesame Street Live contract ends in June, he plans to take a break from touring to spend more time with his 2-year-old daughter, Lyric, and to look for work in advertising. “Ultimately, I’d like to return to children’s entertainment in some way, maybe in marketing,” Hines-Garrison said. His dream job: vice president of marketing at Sesame Place. Despite his busy schedule, Hines-Garrison, who was a student at Temple University until he was cast in the touring company, has taken a full load of classes most semesters since he enrolled at Penn State. He tries to do most of his schoolwork on days off, “which are pretty infrequent — usually one 24-hour period per week,” he said. On Sundays there is just one show, and Hines-Garrison uses the extra time to study.